This post has been brought to you by United Market Street. All statements and opinions are my own. Did you know that it's halibut season? Fresh Pacific Halibut is arriving at Market Street now. Here's one of my favorite ways to serve halibut. Your family will enjoy the unusual presentation and the savory-sweet steamed fish and vegetables. 1. Preheat oven to 400 degrees. In a small saucepan, combine all the ingredients for the sauce, and whisk to combine. Bring to a boil, then simmer for about two minutes until mixture thickens slightly. Remove from heat and keep warm. 2. In the center of each parchment square, place 1/4 of the bok choy in a compact mound. Lay 4 to 5 red pepper strips over the bok choy. Place a halibut fillet on top of the pepper strips. Spoon 3 tablespoons of teriyaki mixture over the halibut, covering it completely. Add a grind or two of black pepper to the fish, if desired. Top halibut with 1/4 of the green onions and a sprinkle of orange zest. 3. Bring two opposite sides of parchment together over fish bundle. Fold edges over at least twice (this will keep the steam in). Secure with kitchen twine. Fold remaining sides over, again, folding at least twice. Tie with string. Repeat with remaining three packets. Place packets on cookie sheet and bake for 17 minutes. 4. To serve, plate and cut open packets, being careful to avoid hot steam. Serve with rice, if desired. If you live (or visit) in the Dallas, TX, area, be sure to visit a Market Street and get fresh halibut while it's available. This special fish is fresh, never frozen. The seafood department staff can give you expert advice for any of your seafood needs. 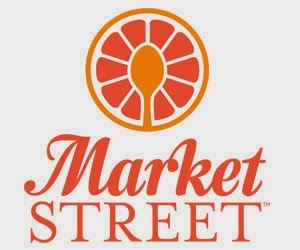 Find a Market Street location near you. That looks so pretty and so yummy! I sure wish I could get anyone else to eat fish besides me! Yum! Delicious! Thanks for sharing. These ingredients sound so good...I would love to try this...thanks for sharing with the Thursday Blog Hop! I am so impressed with this recipe. I love Halibut. You recipe and pictures are beautiful. I would probably never try something like this at home, but I will now since you showed me how easy it is. Thanks so much for sharing. We are trying hard to eat more fish and eat healthier. This recipe includes both of our goals. this looks delicious- thanks for sharing this recipe!! This recipe looks amazing! Was actually looking for some new recipes for fish recently and stumbled upon this from Idea Box. Pinning for later. Looks so good, I have never cooked fish in parchment but have always wanted to try. I love Market Street and have often gone there when we are on our buying trip to the city. Your Teriyaki Halibut looks amazing and I can't wait to try it. Hope you have a wonderful week and thanks so much for sharing with Full Plate Thursday. I've been trying to find more fish recipes so that I don't keep serving the same tilapia dishes I know. This one looks amazing! Pinning it to try next week. Glad I saw it on Making Memories Monday. This sounds so yummy and the presentation is so fun! Can't wait to try it. Thanks for sharing with SYC. Mmmm... This looks and sounds delicious! Visiting from The Art of Homemaking Mondays....thanks for sharing! Have a lovely day! Wowzer! These look A-MAZING! I can't wait to try this out! Thanks for sharing at the Marvelous Monday Link Party! YUUM! This looks awesome, Joy! I will have to make it soon! I simply love it!! oh Joy, this looks so yummy! Pinned it. Did you share it on our blog hop yet? Wonderful Wednesday goes live tonight for a new party (7pm EDT Tues) Be sure to stop by!!! This looks delicious! I also like the no-mess presentation... Nothing to wash :) Thank you for sharing your tasty recipes with us on the Art of Home-Making Mondays! Oh this sounds simply amazing. I can just imagine eating this on a lovely summers day! Our readers loved it too and it will be featured at next week's Marvelous Monday Link party. Thanks for linking up! Wow, that looks delicious. Thank you so much for sharing this yummy recipe with TGI Saturdays. Lovely dish, sure it taste great. thanks for sharing with Hearth and soul blog hop, pinning, tweeting and sharing in google plus.